Coughs, runny noses and fevers – We get more of them in the winter months. Is this a side-effect of the natural temperature-sensitivity of almost all respiratory viruses? Every winter, colds and flu increase. Moreover, poor clothing, cold weather, wind and rain all tend to increase respiratory illness. What’s going on? It’s late March, and I’m traveling through northern India as I write this. At this time of year the temperature rises above 37°C every day, so you might be surprised to hear that a high proportion of the population has a cold at the moment. On buses, in airports and on planes, you hear someone coughing or sneezing every few seconds, and most of the taxi drivers who have given me a ride were sniffing, coughing and spitting. (It’ll be a miracle if I get home without suffering in the same way!) I saw something similar the first time I came to India a few years ago, and it started me thinking about respiratory viruses, because I could see that the conventional explanations of the seasonality of colds and flu just weren’t going to work here in India. In fact I travel for work in many different countries, and I’ve taken to asking the people I meet (scientists, mainly) whether the general population in their country believes that cold weather and chilling will increase the chance of getting a cold. The response has been a very clear “yes”. Whether or not my friends believe it themselves, they all agree that the man or woman in the street believes it. This belief seems to be universally present throughout the world, although it takes different forms. A famous English folk-song says that venturing onto Ilkley Moor without a hat will be fatal. In 1902 Beatrix Potter wrote The Tale of Peter Rabbit, who caught a cold after he hid from the gardener Mr. McGregor in a watering-can. In Russia parents worry – much more than we do in the UK – when, for example, their children leave a swimming pool with wet hair. In Tokyo, cold clear weather is thought to cause the trouble. In South China, Singapore and Indonesia wind and rain are the culprits, while in Fortaleza (northern Brazil) it’s clear to everyone that colds and flu make their appearance in the rainy season. Here in India, some people say that cold epidemics are caused by the daily 12°C fluctuations, while others think it’s got something to do with air conditioning. Some characteristics of human respiratory viruses. As a result, a cottage industry of scientific publication has sprung up, with scientists all over the world reporting on the influence of weather etc. in their city or region, usually with an acknowledgment that there is no good scientific explanation of their findings. Instead of going back to first principles and trying to come up with explanations that do work, science seems to have put the whole problem into the “too difficult” box, and is busy ignoring it. There have been attempts at rational explanation, discussed below, but all the well-known ideas are either incompatible with tropical observations, or apply only to certain strains. For example, a fashionable explanation of influenza seasonality could work for that virus, but it would give the opposite prediction for rhinovirus – although both viruses are (of course) much more common in winter. We should be looking instead for an explanation or explanations that can explain the seasonality of all (or almost all) common respiratory viruses. The unhelpful training that I and others received at university seems to be the result of the misinterpretation of a series of experiments in the 1950s and 60s, described below, where volunteers were chilled after being inoculated with a respiratory virus. They might have been good experiments, but the conclusions drawn are simply wrong – a realization that is becoming increasingly obvious. In a moment I will give you what I think is the correct explanation, but first some natural history is needed. Viruses are quite often seen to jump from one species to another, and it’s obvious that this has been going on for millennia. (Here we can think about all classes of animal viruses, not just respiratory ones.) Strangely – and this is a key observation – viruses that switch rides are at first often more dangerous than strains that have persisted for several centuries in the same host species. The various “haemorrhagic fevers” that humans catch from other animals (including mice and ticks), Ebola, SARS, HIV and bird flu are all examples. Myxomatosis, an insect-borne virus that spread from wild rabbits in South America to European rabbits, is another. Such viruses are unusually dangerous, and quite often cause the death of their host. This implies that over time an equilibrium is reached as a virus adapts to its host, with the most successful strains developing intermediate levels of virulence – not too passive, but not too aggressive either. This makes logical sense. A virus that has a long incubation period and doesn’t at first give its human or animal host a high fever is likely to spread further and faster than one that very aggressively attacks its host, such as Ebola virus. In other words it’s probably not a coincidence that viral diseases are often inconvenient, but seldom fatal, and that they don’t actually make complex multicellular animals impossible. This moderating selection probably acts especially strongly in prosperous modern human societies, because we have the luxury of staying at home and going to bed when we feel unwell or have a fever. Other animals show similar behavior, however: a cow with foot-and-mouth disease doesn’t usually move around and mix with other cows – it will generally stand in a corner of a field, and be very reluctant to move – even when shoved by a farmer or vet. The idea that this kind of equilibrium will be established isn’t new. It’s predicted by the “trade-off” model of virulence. This model suggests that the benefits of virulence (in particular the increased rate of virus production and shedding) are balanced against the reduction of the time during which shedding takes place, and also by changes in the behavior of hosts, when virulence is too great. How does this relate to seasonality? Well, it gives us the crucial insight that viruses generally moderate their virulence. They also need to control which parts of the body they infect – for example, infecting the heart or the nervous system is a bad idea, because both are likely to stop your host from moving around, or worse, to kill it. Since almost all respiratory viruses are much more common in winter than in summer, we have a clue: the key to understanding viral responses may lie in temperature sensitivity. My suggestion is that the seasonality of viruses and the appearance of viral epidemics after cold snaps are both side-effects of the natural biochemical temperature sensitivity of virtually all respiratory viruses. This property can allow viruses to cause severe local infections without incapacitating the host – and obviously the resulting irritation can cause coughing, sneezing and runny noses, all of which will help to transmit the virus. I wrote a paper about viral temperature sensitivity and seasonality recently, where I labelled this mechanism “M4” [ref.1]. Now there are several other explanations of seasonality that are popular with scientists (categorized as M1, M2 and M3 in my paper), but it’s generally acknowledged in the scientific literature that none of them can do a good job of explaining the behavior of viruses. For example, some scientists have suggested that we tend to stay indoors and crowd together more in winter than in summer, which increases transmission (M1). Others point out that some virus particles suspended in air can survive longer in cold, dry, wintery conditions (M2). A third explanation is based on the idea that our immune defenses are somehow weaker in winter (which, studies of vaccination have shown, in general they’re not! M3). 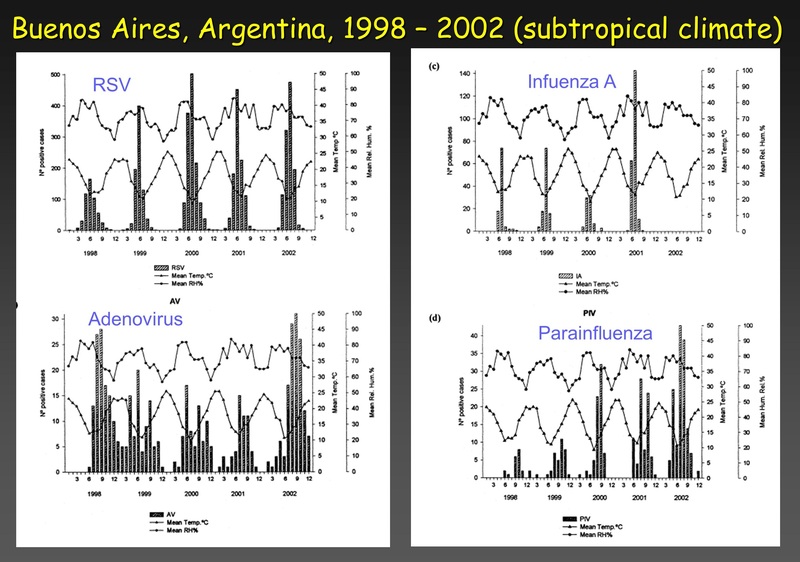 However, there is one very fundamental objection that rules out all these mechanisms as the principal drivers of seasonality: although the same or very similar viruses cause infections all over the world, viral respiratory diseases are more common in the tropics year-round than in the summer in temperate zones. (For examples, see the Figures on the right-hand Sidebar, or below if you are looking at this on mobile phone.) This is hard to explain! Whichever of these alternative explanations (M1 – M3) you focus on, the parameters are more extreme in the tropics than in temperate summers. There may be less sunshine, less moisture in the air, and we may stay indoors more in the winter than in the summer (in temperate regions), but isn’t there even more sunshine, more moisture in the air, and don’t people – at least poor people – stay outdoors even more in the tropics than in the summer where I live? The strange global distribution and seasonality of influenza and other viral respiratory illnesses, shown schematically. Time is indicated across the figure, while latitude is indicated from top to bottom. Levels of respiratory illness are indicated by brown shading, with dark brown showing the highest rates of infection. The yellow curve shows the path of vertical solar radiation. The strange distribution of respiratory illness is shown, with more illness in the tropics throughout the year than in temperate regions during the summer months. In particular, we need to explain why viruses that have travelled in the direction indicated by the pale blue arrow do not thrive in temperate regions during the summer months. 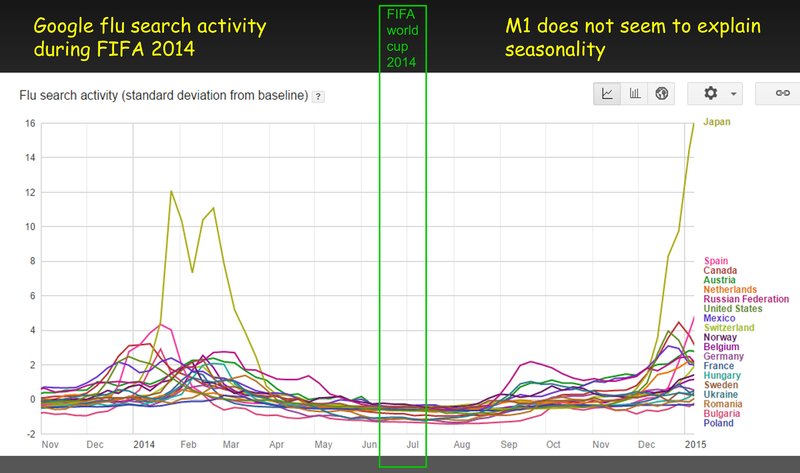 There are other problems with M1 – M3 as explanations of seasonality. Epidemics often arrive throughout wide geographical areas in an extraordinarily well-synchronized way. Johannes van Loghem, a Dutch professor of Hygiene, was one of the first to observe this in the 1920s [ref.2, and see the first Figure on the right-hand Sidebar – below on a mobile phone]. 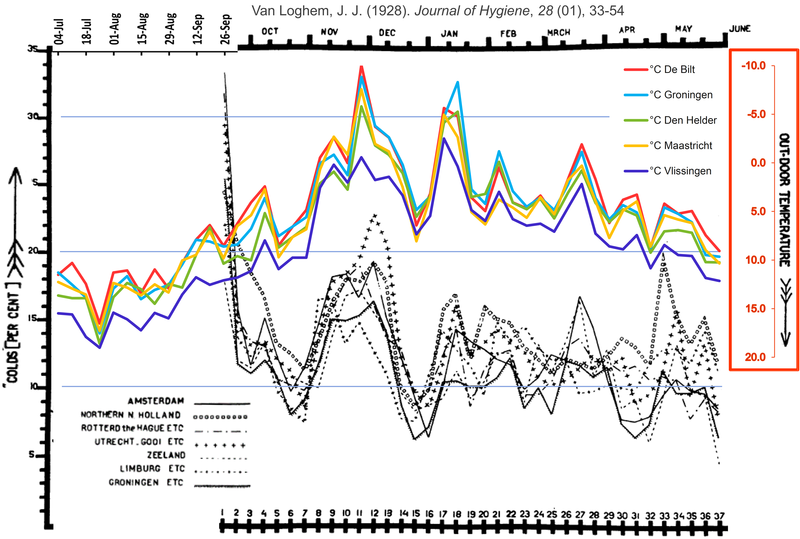 He found that – roughly one week after ambient temperature dropped – cold epidemics arrived almost simultaneously throughout the whole of the Netherlands. There was no evidence of waves of infection moving around the country, which would be predicted by mechanisms M1 – M3. 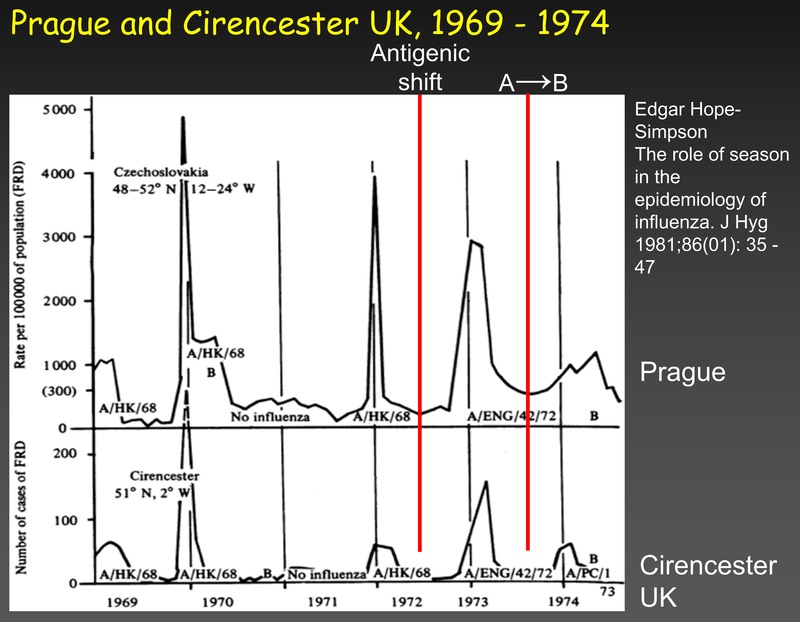 Edgar Hope-Simpson saw something very similar when he compared influenza in Prague (Czechoslovakia) with the same illness in his medical practice in Cirencester, UK, where he carefully identified the flu strains involved (see the second Figure on the right-hand Sidebar or below). 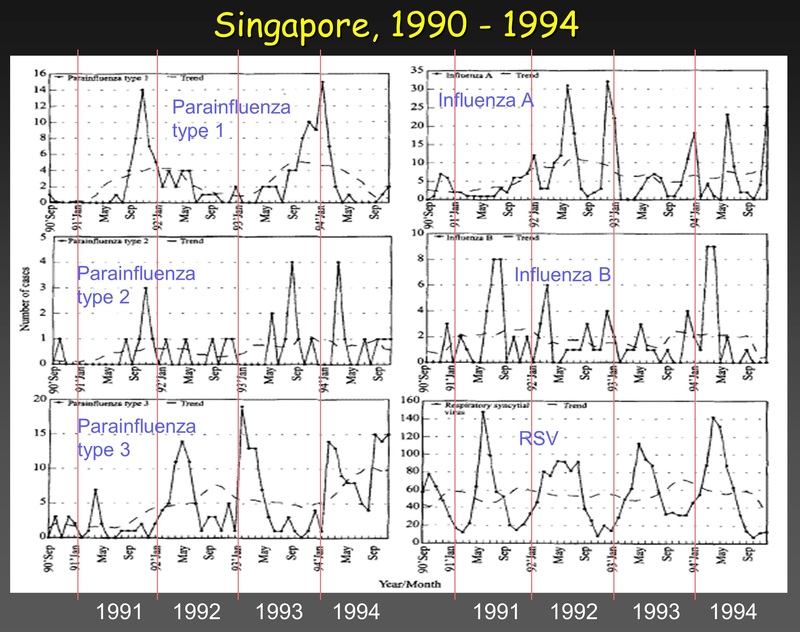 Spikes of influenza appeared almost simultaneously in the two locations, in spite of antigenic shifts from Hong Kong to English flu in 1972, and from influenza A to influenza B in 1973 [ref. 3]. Again, there were no signs of waves of infection that moved across Europe. The last explanation (M3), the suggestion that our immune systems are weaker in winter than summer, is also incompatible with the experiments that caused so much of the trouble in the first place. As I mentioned before, in the 1950s and 60s hundreds of volunteers were first kept in quarantine, then inoculated with a recycled “pedigree” virus (which was passed from volunteers to subsequent batches of volunteers in later experiments). Some individuals were then chilled, while others stayed warm. No significant difference between the two groups in the number of colds was seen, and the researchers concluded that chilling did not bring on colds. This was repeated over many years and in different laboratories. Now, if our immune systems are weaker after chilling, why didn’t these experiments give increased infection rates after chilling? M4 predicts that respiratory illness will be more common in the winter because, as the temperature drops, viruses that are present in our respiratory tracts will become more active. In spring, when the temperature rises, they will become less active. In the case of rhinovirus, it was recently shown that the virus then remained dormant (or hidden, anyway) over the summer [ref. 4]. M4 also suggests that viruses can adapt to life (if viruses can be considered to be alive) in tropical locations. As I mentioned earlier, there’s a temperature gradient in the respiratory tract (RT) from the nose to the lungs. Therefore, in warmer climates we might anticipate that respiratory viruses would colonize the RT closer to the nose, while in cold climates the same strain would naturally colonize the RT closer to the lungs. It should also be possible for viruses to rapidly lose or gain temperature sensitivity as they move or are transported around the world – they have very high mutation rates and can evolve very quickly. When a strain arrives in a new location, it will therefore be able to adjust its temperature-sensitivity reasonably quickly to the local climate – which it needs to to in order to transmit itself efficiently. I must also comment from personal experience that it’s noticeable that if you pick up a cold in the tropics and return to the UK it often goes to the lungs and tends to be particularly nasty and unusually persistent! Note that studies show that influenza moves from hot climates to cold ones more frequently than it moves in the opposite direction [ref.5, check out Extended Data Figure 3]. According to M4, the reason for the failure of the classic 1950s and 60s experiments to show an effect of chilling was most likely the investigators’ choice of viral strains. They generally used ‘‘pedigree” strains that were passed from volunteers to subsequent batches of volunteers in later experiments. These pedigree strains may have lost part of their temperature sensitivity (particularly with regard to the early steps of infection, binding and cell entry) because the investigators may have accidentally or deliberately selected strains that gave colds quickly. Why is this important? I was taught at school that science is about understanding the world around us. There is often a debate about whether it’s better to carry out fundamental research or work on more practical applied subjects. The answer that is often given is that you can never predict the practical benefits of fundamental research, so we should try to get the fundamental understanding in place before we start on the applied work. So it’s quite extraordinary that five generations of scientists have, in effect, said “we can’t fully explain seasonality, it’s very complicated, but we all know that ambient temperature and chilling play no part. But please give us money for vaccine development, immunology, drug discovery, viral epidemiology, bioinformatics, evolutionary studies etc.” A more rational approach would start with the big questions that apply to all respiratory viruses – and viral seasonality and the response of respiratory viruses to host chilling are key questions that, rightly, scientists grappled with before they even knew what a virus was [ref.2]. 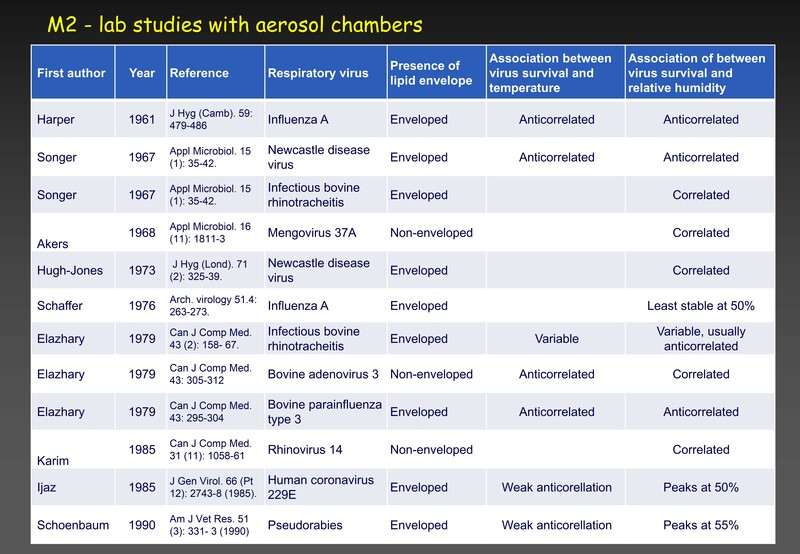 And if answers can be found they will be relevant to all of the above areas that virologists want to study. Just as extraordinary are the obvious avenues for practical research that have been neglected by doctors and microbiologists – apparently because they conflict with the established dogma. Twenty years ago a consortium of European scientists set out to apply the techniques of market research to discover whether different climates, and different steps taken to protect against cold, influenced winter mortality in eight European regions ranging from northern Finland to Athens [ref.6]. 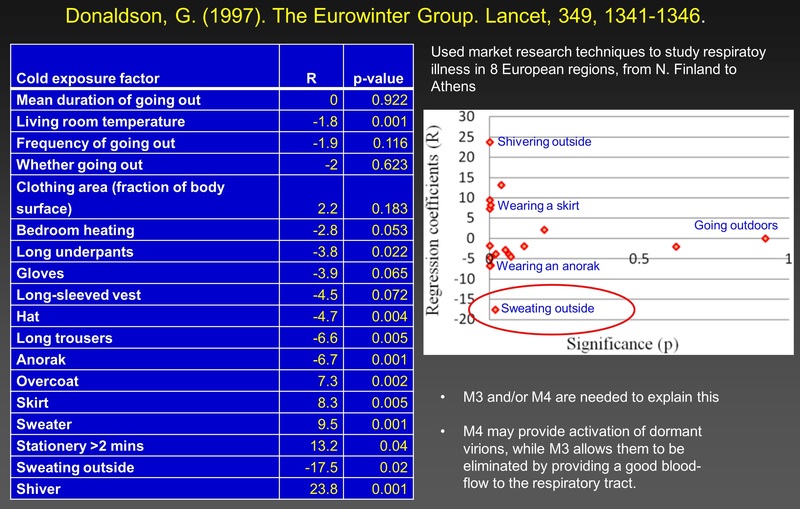 They showed that standing still outside for more than two minutes (p=0.04), wearing a skirt (p=0.005), and shivering outside (p=0.001) are all dangerous activities because they increase the probability of dying from respiratory disease (see the sixth Figure on the right-hand Sidebar, or below on mobile phones). On the other hand, wearing an anorak (p=<0.001) and taking outdoor exercise sufficient to cause sweating (p=0.02) are strongly protective. This publication is regularly cited by papers that show for the umpteenth time that respiratory illness increases when ambient temperature drops (in some particular part of the world), but no-one has taken the obvious step of following up the practical implications of this paper. For example no-one has investigated whether old people can be protected by going outside in cold weather, well wrapped-up, to take brisk exercise. It seems that the experts won’t try this kind of thing because they “know” it won’t work. What is needed is empirical evidence. These problems could be tackled at many levels. For example, (i) experiments could be carried out with volunteers, with some participants being chilled and others not – this time relying on “wild” viruses that the volunteers happen to be carrying (rather than inoculating them with massive doses of artificial “pedigree” or laboratory strains). (ii) Animal experiments with wild and “labelled” viruses could be carried out to investigate both the transmission and localization of virions in the respiratory tract. (iii) The temperature-sensitivity of the various steps of cell entry and replication in both wild and laboratory viruses could be investigated in cell-cultures – much of the data that is available now was collected by accident in studies that were designed to investigate something else. (iv) The DNA and RNA sequences of wild and laboratory viruses could be analyzed, focusing particularly on something called “RNA secondary structure” that a lot of my readers will know about. (v) Epidemiologists and bioinformaticians could investigate changes in sequences and virulence in a variety of viral species as they move around the world. Hundreds of thousands of people – sometimes millions – die every year of respiratory illness, particularly the very old and the very young. All these experiments have the potential to answer fundamental questions, provide practical solutions, and save lives. I’ve put these points to dozens of famous professors and doctors. I’ve given a talk at an international virology meeting (and I thank the organizers for giving me the opportunity) and I’ve shown my scientific poster to many microbiologists. A few scientists and doctors have very kindly listened to me, but the majority won’t read my paper and don’t engage with the arguments. In fact they sometimes ignore the clearly-stated conclusions of their own papers! If you find this blog or my paper interesting, please do me a favor and leave a comment! Shaw Stewart, PD. Seasonality and selective trends in viral acute respiratory tract infections. Medical Hypotheses 2016; 86 104–119. Van Loghem JJ. An epidemiological contribution to the knowledge of the respiratory diseases. J Hyg 1928; 28(01):33–54. Hope-Simpson RE. The role of season in the epidemiology of influenza. J Hyg 1981; 86(01):35–47. Granados A, Goodall EC, Luinstra K, Smieja M, Mahony J. Comparison of asymptomatic and symptomatic rhinovirus infections in university students: incidence, species diversity, and viral load. Diagn Microbiol Infect Dis 2015; 82 (4):292–6. Bedford, T., Riley, S., Barr, I.G., Broor, S., Chadha, M., Cox, N.J., Daniels, R.S., Gunasekaran, C.P., Hurt, A.C., Kelso, A. and Klimov, A., 2015. Global circulation patterns of seasonal influenza viruses vary with antigenic drift. Nature, 523(7559), p.217. Donaldson G. Cold exposure and winter mortality from ischaemic heart disease, cerebrovascular disease, respiratory disease, and all causes in warm and cold regions of Europe. The Eurowinter Group. Lancet 1997; 349:1341–6. Mudd S, Grant SB. Reactions to chilling of the body surface: experimental study of a possible mechanism for the excitation of infections of the pharynx and tonsils. J Med Res 1919; 40(1):53. Andrewes CH. Adventures among viruses. III. The puzzle of the common cold. N Engl J Med 1950; 242(7):235–40. Dowling HF, Jackson GG, Spiesman IG, Inouye T. Transmission of the common cold to volunteers under controlled conditions III. The effect of chilling of the subjects upon susceptibility. Am J Epidemiol 1958; 68(1):59–65. Allen TR, Bradburne AF, Stott EJ, Goodwin CS, Tyrrell DAJ. An outbreak of common colds at an Antarctic base after seventeen weeks of complete isolation. J Hyg 1973; 71(04):657–67. Muchmore HG, Parkinson AJ, Humphries JE, Scott EN, McIntosh DA, Scott LV, et al. Persistent parainfluenza virus shedding during isolation at the South Pole. Nature 1981; 289:187–9. Morikawa S, Hiroi S, Kase T. Detection of respiratory viruses in gargle specimens of healthy children. J Clin Virol 2015. Randall RE, Griffin DE. Within host RNA virus persistence: mechanisms and consequences. Current Opinion in Virology 2017, 23:35–42. Du Prel JB, Puppe W, Gröndahl B, Knuf M, Weigl F, Schaaff F, et al. Are meteorological parameters associated with acute respiratory tract infections? Clin Infect Dis 2009; 49(6):861–8. Viegas M, Barrero PR, Maffey AF, Mistchenko AS. Respiratory viruses seasonality in children under five years of age in Buenos Aires, Argentina. A five-year analysis. J Infection 2004; 49(3):222–8. Chew FT, Doraisingham S, Ling AE, Kumarasinghe G, Lee BW. 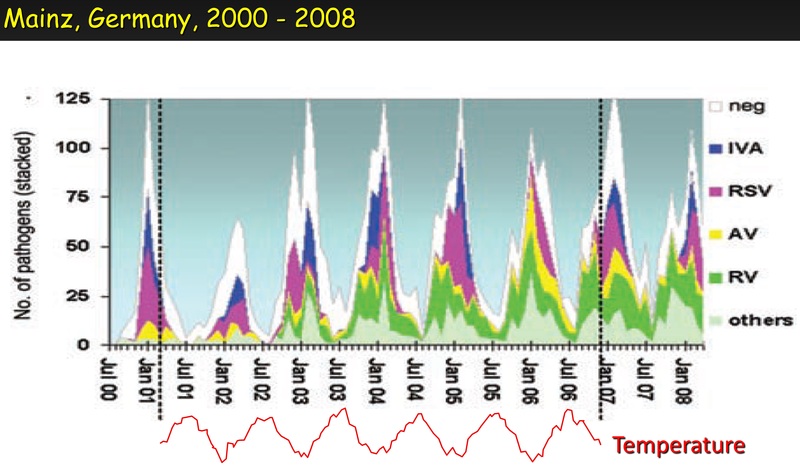 Seasonal trends of viral respiratory tract infections in the tropics. Epidemiol Infect 1998; 121 (01):121–8. Russell PH. Newcastle disease virus and two influenza viruses: differing effects of acid and temperature on the uptake of infectious virus into bovine and canine kidney cell lines. Arch Virol 1986; 88(3–4):159–66. Kashiwagi T, Hara K, Nakazono Y, Hamada N, Watanabe H. Artificial hybrids of influenza A virus RNA polymerase reveal PA subunit modulates its thermal sensitivity. PLoS ONE 2010; 5(12):e15140. Dalton RM, Mullin AE, Amorim MJ, Medcalf E, Tiley LS, Digard P. Temperature sensitive influenza A virus genome replication results from low thermal stability of polymerase-cRNA complexes. Virol J 2006; 3:58. Author PatrickSStewartPosted on March 30, 2017 April 25, 2018 2 Comments on Every winter, colds and flu increase. Moreover, poor clothing, cold weather, wind and rain all tend to increase respiratory illness. What’s going on?